QPR have today signed Italian striker, Alessandro Pellicori on a 3 year deal. Good Luck Alessandro and WELCOME to QPR!!! Rangers were on their travels for the second time in 24hours, this time the destination was Rockingham Road, the home of Kettering Town. Jim Magilton took a squad with a mixed bag of first team players, youth and three trialists (Marshall, Vignal and Pellicori) as he looked to give as many players valuable playing time ready for the start of the new season. Within minutes of kick off the heavens opened and the downpour we witnessed was almost monsoon like and lasted a good 8-10 minutes. This downpour created very difficult playing conditions which affected the quality of football for the remainder of the game. Despite the difficult conditions Rangers still tried to play the passing game that Jim Magilton and the coaching staff have installed into the team and was working with good effect. On the 10 minute mark Oastler and Taarabt exchanged passes before setting Vignal free on the left hand side. Vignal put in a cross to the back post and Helguson met it heading the ball into the ground and beating former R's keeper Lee Harper. The next 10minutes were fairly scrappy and fairly even. Rangers carried on trying to play slick football on the sticky playing surface. Oastler was playing in a holding midfield role, receiving possession every time he could and has looking to play in one of our attacking midfielders before trying to set off on another counter attack. The experimental back four with Ainsworth playing right back (as he did for the reserves last season), Stewart was as dominating as ever, Borrowdale was slowly getting used to playing centre back and Vignal followed up where he left off last night and was running up and down the left flank at any opportunity he could. Rangers next attacking threat came on 23 minutes. Taarabt found Ephraim who ventured into the Kettering half taking on 2 opposing players and saw the advancing run of Pellicori. Pellicori took the ball in his stride with some great control which took him clear of both defenders and bared down on goal and his unstoppable effort from close range made it 2-0 and Rangers really were cruising. The last 20 minutes of the half were played in midfield and it was the Superhoops that enjoyed the lion share of the possession. Taarabt was enjoying himself in his free role and was given his fair share of the ball but he often took one touch too much or was closed down extremely quickly. Half time soon come along and it’s fair to say Jim and John would have been fairly happy with the players efforts over the 45minutes. There was only one change at half time, Vignal coming off as he played over half an hour last night as well. Lee Brown was his replacement. Ten minutes inside the second period Helguson and Pellicori linked up well which sent the Italian clear. Unfortunately his effort flew wide of Lee Harper's goal. The last memorable action of the half was a very dangerous challenge on Ainsworth. In true Gaz style he picked himself off the floor and run the knock off. The usual mass substitution frenzy came upon both teams which broke play up as the game petered through the closing stages of the match. In summary the game was ruined by the early downpour and we never really show the true potential of the team. Both goals were very well taken. Vignal showed good potential going forward but wasn’t tested defensively. It was a good run out but in fairness it would've been nice to see us in full flow in better conditions. Marshall- Had very little to do but he was very vocal in organising his defence. If he is signed up he will provide excellent back up to Cerny. Ainsworth- A typical Gaz performance, full of passion and commitment. He is an excellent example to all the youngsters. It would be so good if everyone had his desire to win. Stewart- Was pretty solid at the back and led the line pretty well. Borrowdale- Didn’t do much wrong. Mis-placed a few passes but overall wasn't too bad. Vignal- Was excellent going forward and provided an excellent cross for Helguson's goal. Oastler- Played fairly well as a holding midfielder. Always looks for the simple ball and never panics under pressure. Alberti- Wasn't his best game, came into the game a lot more towards the end. Taarabt- Had a lot of possession but often took a touch too much. Wasn't his best game. Ephraim- Played ok. Was full of running. Played the assist in the 2nd goal. Helguson- Played ok. Put his chance away well. Looked to get involved wherever he could. Pellicori- Done fairly well. Took his goal extremely well. Will do better with the likes of Buzsaky, Rowlands and co in the same team as him. Brown- Attacked the left hand side well during the second half. Wasn’t tested out defensively. German- Was full of running but had no real sight at goal. Harris- Looks as if right back isn't his strongest position. Will be interesting to see him progress in the reserves at centre back this season . Davenport- Done well when he came on. Decent prospect for the future. Parker- Attacked the left hand side well and his pace is frightening. Good future ahead of him. Rose- Done well when he come on. Once again, big thanks to Lee Brown who brings you his report from last night's friendly win over Wycombe Wanderers. In the first of 3 friendlies this week, all of which covered here on Lofty Heights, QPR took the short trip down the M40 to League 1 new boys Wycombe Wanderers. Roughly (a rough guess by the Henley mob) 1,300 travelling fans made the trip to Adams Park to witness the event unfold. Jim Magilton again named a strong squad as he begins to get a rough idea of which starting 11 for the start of the season. In fact it was the same starting 11 from the previous friendly at Oxford United on Friday night. Gregory Vignal joined the squad on a weeks trial and took his place in the squad as he looks to earn a contract with the Superhoops. The left back has previously played for Montpellier, Liverpool, Portsmouth and Lens. He has also had loan spells at Bastia, Rennes, Espanyol, Rangers, Kaiserslautern as well as Southampton last season. Team (from right to left):- Cerny; Ramage, Hall, Gorkss, Connolly; Routledge, Mahon, Rowlands, Balanta; Vine, Agyemang. Subs- Putnins, Alberti, Brown, Oastler, Vignal, Parker, German, Taarabt. Barely had the game begun and the Rangers fans were celebrating. After some good passing Routledge found himself out on the right hand side and put over a delightful ball which found the new goal machine of our team Gavin Mahon and he put his diving header away from all of 4 yards out, leaving opposing 'keeper Jamie Young with no chance. Rangers were playing the slick passing football that we have got used to seeing over the last few pre season games and Angelo Balanta was again causing all sorts of problems for his former team mates. On 8 minutes Wycombe had their first attempt on goal, which Cerny dealt with pretty easily. It was from there that Rangers launched their next counter attack. Balanta broke away down the left hand side and fed in Vine. Vine crossed in from the left hand side, it was half cleared to Agyemang who took one touch and drilled home is effort from 10 yards. 9 minutes gone and it was already 2-0. Rangers really were in control, passing the ball around with ease and looking to break away with pace once we found the space in behind the Wycombe midfield. It really was all Rangers for all the 45 minutes, Wycombe had no real attacking threat to test the defence which looked pretty comfortable throughout the half. Rowlands and Mahon really bossed the midfield well and this looks like the centre midfield partnership to begin the season with. Routledge was causing problems down the right hand side, Balanta was excellent once again causing all sorts of problems for the Wycombe defenders. Vine and Agyemang do work well together up front. Vine is a very good provider for Agyemang and they do have a near telepathic connection when they are both firing. We were treated to a half time penalty shoot-out from Seer Green under 8s team, 4 of which were wearing QPR shirts. I am glad to say that all of them did score their penalties in front of the large away following. The kids were given huge cheers and hopefully given them a fond memory of their 15minutes of fame. So the second half started and Rangers started exactly as they left the first half, in complete control. Jim and John really have got the troops playing good football, all on the floor at a quick tempo. In the opening 10minutes of the second half Mahon had a 25 yard effort go just wide and that man Balanta placed a shot wide when he really should've hit the target. On 60 minutes the first Rangers substitution came around and it was unplanned. Connolly picked up a slight knock during a challenge so Magilton replaced him with the trialist Vignal. This failed to halt Rangers dominance, in fact it just added another dimension to their attack. Vignal was looking to attack the left hand side at any given opportunity and was practically hugging the touchline. Balanta and Agyemang had efforts that were fired wide as Rangers starting to take the foot off the gas. Vine was replaced by Taarabt on 68 minutes to try and liven up proceedings and he was up to his usual tricks and causing problems for the opposing defenders but Rangers were just toying around in the midfield and were not in any danger at all. On 83 minutes Wycombe grabbed a goal back. A free kick on the right hand side was drifted over to the far post, Michael Duberry headed back across goal and found Luke Oliver unmarked and he tapped home from a few yards out. Rangers made 3 more changes taking off Routledge, Rowlands and Agyemang. In their places came Parker, Alberti and German. The final minutes were played out with Rangers passing around with ease, yet they did not create any open opportunities. Overall it was by far the best performance of pre season. We looked comfortable on the ball, passed the ball around with ease and for the first time we actually got out of first gear and asserted our authority on lower league opposition. Cerny- Had little to do and looked good. Ramage- Kept things simple. Attacked the right hand side when we were going forward. Made a few mistakes but nothing to worry about. Hall- Had a pretty good game. Only 1 silly foul and minimized the long ball tonight. Got skinned once but apart from that he was ok.
Gorkss- A non dramatic performance. Didn’t put a foot wrong. Connolly- Comfortable at left back. Really would prefer him at centre back. Routledge- Lively, created enough problems for the Wycombe defence. Didn’t run at people as often as usual but didn’t need to. Mahon- Took his goal well. Hussled the midfield well, looks a good partner for Rowlands to start off the season. Rowlands- Put in another good shift on his return to full fitness. Bossed around and looks to be well on his way back. Balanta- Fantastic once again. Magilton will find it hard to resist not starting him off against Blackpool. Man of the match. Vine- Floated around and linked up well with the wide men. Agyemang- Took his goal well. Drifted in and out of the game to much. Vignal- Made a good start. Was very attacking and put in 2 or 3 decent crosses. Defensively looked sound. Taarabt- Tricky, linked up with the midfield well, would like to see him get longer so we can properly judge him as a centre forward. Parker, Alberti and German- These 3 were not on the field long enough to really make an impact. Parker had one decent run down the right, German chased around and Alberti put in a few decent challenges. 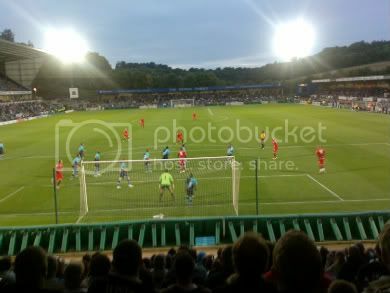 Thank you once again to, Lee Brown, who bring's you a report from last night's friendly draw away at Oxford. 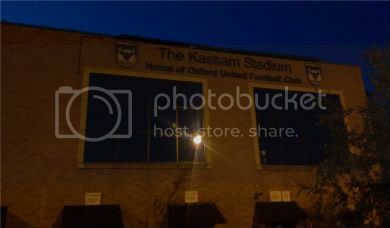 In Rangers 5th pre-season friendly in the build up to the new Championship season it was Oxford United that played hosts at the Kassam Stadium. Nearly 900 travelling fans made the trip to Oxfordshire as Jim Magilton named a strong squad filled full of first team squad members as well as 2 trialists, Andy Marshall and Alessandro Pellicori. It was Rangers that started the game the brighter of the two teams. Angelo Balanta was causing problems down the left hand side and when he played a neat one-two with Vine in the opening minutes he was unfortunate that Vine's return pass was too heavy for him. Minutes later it was Vine who went close after some good build up play down the left hand side. The good start and good passing football found the breakthrough Rangers play deserved on 8 minutes. After a patient build up in defence through the midfield it was Angelo Balanta that found himself out on the left hand side. He picked out Agyemang in the centre who laid off a perfectly weighted ball to the advancing Gavin Mahon, who neatly slotted home a curling effort from 12yards out. Rangers were playing a patient passing game and certainly looked the more offensive of the two teams but were finding it hard to break down the Oxford defence and midfield were content to sit with 10men behind the ball as frustrate their opponents. With this Rangers looked to use the counter attack and use the pace that we possess in Routledge and if it wasn’t for an extremely tight offside decision then Routledge would've been clean through to test the Oxford keeper once again. Following 25-30minutes of dominance Oxford finally showed some attacking prowess and tested the Rangers defence for the first time but the resulting effort was easily dealt with by Cerny. The Rangers defence were spectators for a large period of the half but it was the consistent Connolly who stood out as he was always looking to provide the tricky Balanta opportunities to frighten the Oxford defence with his skills. Gorkks was as reliable as ever, Ramage kept things simple as he always does but Hall looked to me as the weaker link in the back line, seeming to look for the long ball rather than play the patient passing game that we are trying to play and also giving away silly fouls by unnecessarily holding and climbing over the Oxford strikers. Balanta again troubled the Oxford defence before unbelievably trying a 30 yard effort which wasn’t too far off the mark. As the half drew to a close Rangers had one more effort at the hosts goal. Balanta, again, showed good work down the left side played a neat pass into Agyemang who played in Routledge with a delightful pass and setting him clear. Routledge's effort from 15yards out seemed to be heading for the right hand corner before the keeper got a finger tip to it and sent it out for a corner. A pretty good half from Rangers, was very comfortable and if we wanted to we could've gone up another gear or two in my opinion. The 900 in attendance were very lively, considering it was only a friendly we made a hell of a lot noise, especially good as we were just under a third of the total crowd of 3250 ish in attendance. At the start of the second half Magilton made 3 changes. Ramage, Rowlands and Agyemang made way for Borrowdale, Alberti and inspirational new signing Taarabt. Connolly moved over to right back to accommodate Borrow dale’s arrival, Alberti slotted into the centre of midfield whilst Taarabt moved up front. Rangers started as they left off and continued to cause problems. This time Vine down the right hand side advanced with the ball before picking out Taarabt, his tame effort was easily dealt with by the Oxford keeper. Then disaster struck. Oxford quickly counter attacked down the left hand side and it was Constable that had time to line up an effort from just outside the box, his effort was, from where I was sitting, very harshly adjudged to hit the hand of Gorkks inside the area. Penalty! Matt Green scored the spot kick, sending Cerny the wrong way, and celebrated like he had just scored the winning goal in a league match. Looked stupid as to be fair it is only a friendly, but it did start the banter between both sets of fans and it did liven up proceedings. The goal seemed to buoy Oxford and started to come into the game a lot more. Our centre midfield started to get opened up a lot easier after Rowlands departed and we looked vulnerable down the left hand side. However on 62 minutes normal service resumed and Rangers regained the lead. Taarabt was the creator of this goal, he picked up the ball just inside the Rangers half and looked around to see any runs being made by the forwards. However it was Routledge that timed his run to perfection as Taarabt picked him out. Routledge ran into the area, rounded the keeper and even though it looked like he tried his best to muck it all up he slotted home from a tight angle. It was then that the Rangers fans, who hadn't forgot the Oxford chants when they scored, started singing "You're not singing anymore....." It definitely looks as if the Rangers fans are ready for the new season already. Unfazed by going behind, Oxford continued to try and play the good football that was causing us problems before our second goal. Pellicori and Stewart entered the game on 66 minutes for Balanta and Hall. Three minutes later Oxford were back in the game. Alberti was trapped in the left corner in the Rangers defence and had no help from left back Borrowdale which allowed the pressuring Oxford forwards to nick the ball off Alberti and put a cross in the middle. The cross looked an easy one to dealt with and Connolly attempted to chest the ball back to Cerny when it looked easier to clear down the left hand side, but the chest back was on the weak side which allowed the Oxford substitute Midson to poke the ball past Cerny into the empty net. A rare mistake by the reliable Rangers defender. A few minutes later Ainsworth came on for Vine, to the delight of the Rangers faithful. Within minutes of being on the pitch it was Ainsworth who was the provider for our next attempt at goal. He took on the left back in true Ainsworth styli and put in a ball to the back post, Pellicori slid in and attempting to poke the ball home from a tight angle he saw his effort come off the inside off the post and somehow roll away from goal before being cleared to safety. Very unlucky. It was Pellicori again who went close in Rangers next attack. It looked to me as if it was Borrowdales cross from the left which found Pellicori 12yards out and with him jumping backwards and having to generate his own power in the header, saw his effort go agonisingly past the right hand post. The game was there for both teams to win and both went in search for the winner but it wasn’t to be and both teams had to settle for the draw. In summary, for periods of the game we did look to pass the ball around a lot and when we upped the tempo going forwards we did look very dangerous. We did look comfortable and definitely seemed to hold back a bit, we're holding back a gear or two and hopefully in the next week where we have our last three friendlies at Wycombe, Kettering and Southampton we will crank up the intensity so we are ready for Blackpool on the 8th August. We have also highlighted the need for a new left back......... please let it happen in the next week otherwise Mr Connolly will be required out there. Cerny- Virtual spectator for large periods. Is our number 1 keeper so he has no fears. Ramage- Kept it simple, will be nice to see him complete 90minutes in one of the next friendlies. Hall- Done ok. Needs to learn not to look for the long hoof when under pressure. Also needs to stop giving away silly fouls. Gorkss- Comfortable. Took a blow to the head late in the first half but soldiered on. Definate starter for 8th August. Connolly- Was comfortable at both right and left back. Would prefer him in centre defence with Gorkks though. Routledge- Caused all sorts of problems with his pace tonight, would be nice to see him carry on this work ethic. Rowlands- Another useful 45mins for the returning midfielder. Will only get sharper the more he plays. Mahon- Had a good game, a typical performance from the goal machine. Balanta- Exceptional in the first half and caused a hell of a lot of problems. Is knocking on the door for a first team place after his pre season efforts. Vine- Not an out and out striker but has a very good understanding with Agyemang. Looks sharper and has put in a lot of effort in. Agyemang- Set up Mahon's goal. Wasn’t his worst game but he has had better. Ainsworth- Typical effort from the wild thing. Played with passion, ran at defenders and provided a few decent crosses. Seems to have an understanding with Pellicori. Borrowdale- After this I'm still not a fan. Doesn't look good enough for this team and we need a left back. Provided a good cross for Pellicori but otherwise looked troubled. Alberti- I've said it before and I’ll say it again, he's not a centre midfielder. Midfield looked weaker when he came on, he needs to play on the wing. Stewart- Done nothing wrong, won headers and looked largely untroubled. Pellicori- Really like the look of this guy, will win headers and look to hold the ball up. Put in a good shift and was chasing balls down. Unlucky with his two efforts, if we sign him I'd be happy. The man will score goals. Taarabt- Played well, holds the ball too long at times but is a joy to watch. What makes it better is that he hasn’t trained with the guys under Magilton's leadership. Will need to improve his striking of the ball as he had two or three efforts which looked like they were passed back to their keeper. 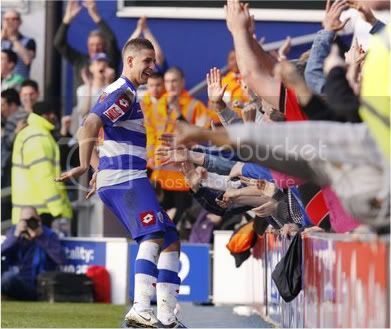 QPR have reached an agreement with Spurs for the season long loan signing of Adel Taarabt. Taarabt was a huge hit with the Loftus Road faithful during his loan spell last season, making 7 appearances and scoring once. The deal is expected to be completed before the weekend. WELCOME BACK to QPR, ADEL!!! Once again, Lee Brown is your reporter from the R's latest pre season friendly away at Forest Green last night and news also, of Dexter Blackstock's move to Forest. 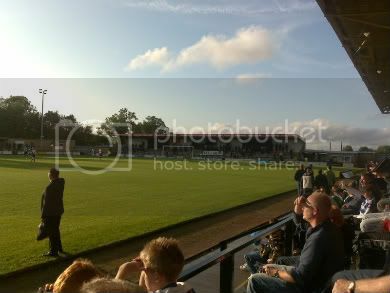 Following our friendlies over in Slovenia and Croatia the Rangers faithful got another chance to see how preparations in the lead up to the new season were progressing with a visit to Blue Square Conference side Forest Green. Just myself and Henley Mob member Sam that made the 160 miles round trip to The New Lawn, which must be on top of one of the biggest hills in the country, it was like climbing Everest, my poor car nearly gave up halfway through the climb. Once that was navigated and parked up at a nearby school we took the short walk up to the ground to see what would be thrown at us on this visit. Jim Magilton named a very youthful squad which included only 6 recognised members from the first team squad, 3 trialists and 8 players from our youth ranks. Andy Marshall - an experienced goalkeeper with a decent amount of championship experience. Alessandro Pellicori - A tall Italian striker who we have been heavily linked to signing over the last few weeks. Davide Somma - Another tall striker from South Africa that also has an Italian heritage. His goal scoring record over the past few years is far from impressive, 3goals in competitive games in over 5years!! Marshall; Rose, Stewart, Oastler, Brown; Ephraim, Rowlands, Alberti, Buzsaky; Pellicori, AgyemangSubs: Putnins(GK), Parker, Harris, Davenport, German, Somma. Within 70secs we had our first goal of the game. Rowlands swung in a corner from the left hand side which Rovers keeper terry Burton fluffed horribly, the ball fell in the path of Damien Stewart who had an empty net to poke the ball home. He will never score an easier goal! 1-0! Rangers looked comfortable in the first 20mins, using a lot of patient build up play between defence and midfield before attempting to hit Forest Green on the break. Romone Rose and Hogan Ephraim linked up extremely well down the right hand side regularly and this is where we looked the most dangerous, attacking down the right with Rose providing excellent overlapping and decent crossing for our front pair. Over on the other side of the pitch Buzsaky was struggling to make any kind of an impact on the game and Brown seemed to be afraid to run beyond Buzsaky in case he got caught out. Rowlands was his usual self and was bossing the midfield and looking to come deep at any opportunity before trying to set us on the attack again. Alberti seemed to get frustrated in the centre and was pretty much sitting on the back 4 trying to collect the ball and have some involvement, he gave away possession cheaply at times but he was working hard. The centre back pairing of Stewart and Oastler were solid, nothing was going through the pair of them and they were also trying to play the ball out of defence rather than trying to lump it up to the front men. The next notable action came on 32mins. Rowlands was fouled 30yards out which allowed Buzsaky the opportunity to finally get involved in the game. Akos hit an absolute beauty (which apparently got finger-tipped onto the post) the rebound fell kindly to Pellicori, who made no mistake and placed a diving header into the empty net. 2-0! Shortly after the second goal Forest Green had their first real attack of the game. After some neat passing David Brown hit a shot from 15yards out which was comfortably dealt with by Marshall. In the last real action of the first half, Agyemang was fed in down the left by Ephraim, took on two defenders and instead of squaring to the advancing Pellicori, who would've probably made it 3-0, took a shot which was blocked and went out for a corner. 3 changes were made at half time. Rowlands, Buzsaky and Stewart made way for Danny Davenport, Ed Harris and Davide Somma. As with many friendlies the second half was littered with substitutions that largely disrupted the game but this seemed to help the home side as they enjoyed a lot more possession for the duration of the half but never really threatened as the back four of Rose, Harris, Oastler and Brown seemed to soak everything up for large periods and were directed well by goalkeeper Marshall throughout the half. Rangers were still trying to play the slick passing football that a Jim Magilton side does and the understanding that was within the youth players was certainly pleasing to see and we did look dangerous when going forward with the pacey Parker down the left and with the German/Somma partnership looking to break the offside trap. Rangers seemed to tire over the last 10-15mins and Forest Green enjoyed their best spell of the game and tested Marshall on three occasions. In final minutes Somma thought he had scored the third hoops goal of the evening, heading in from Alberti's cross and was adjudged to be offside, it looked tight from where I was sitting, but I am going to be slightly biased on decisions like that. Overall it was another good workout, especially considering we fielded a young squad. We really need to crank it up now for the final 3 pre-season games before the start of the season. These games will really show Jim how far along we are and where we need improvements in the squad..... although we already know we need a striker and a left back! Forest Green can take a lot of credit out of the game, they battled hard and kept going throughout the 90mins. They had a good amount of possession at the end and did cause a few problems in the final 10-15mins. Marshall, Rose, Stewart (Harris, 46), Rowlands (Davenport, 46), Brown, Oastler, Ephraim, Alberti, Pellicori (German, 65), Buzsaky (Somma, 46), Agyemang (Parker, 59). Marshall- Organised his defence well, had 4saves to make all game. Was very vocal! In my opinion he would provide decent back up to Cerny, although he does need another run out before we should offer a contract. Oastler- Highly impressive over the 90minutes. Played the ball out of the defence all the time, won the majority of his headers and looked very reassured. Man of the match! Brown- Looked nervy first half but looked extremely good second half, regularly running down the left flank and supporting Parker. Would like to see him get another go. Ephraim- Looked dangerous down the right wing in the first half. Was a lot more composed in centre midfield in the second half. Rowlands- Bossed the midfield in the first half, looked good considering it was his first game back. Alberti- Really doesn’t convince me as a centre midfielder. Dropped deep a hell of a lot. Would like to see him back out on the wing where he is dangerous. Buzsaky- Fantastic free kick that he was unlucky to hit the post with, otherwise I cant really report on anything else he done. Is wasted out wide and needs to play in the centre!! Pellicori- Looked unfit to start with but became more involved as the game went on. Looks like a target man and always looked to provide the flick on with all the headers he won. Held the ball up well, he would suit a small pacey striker to provide for. Is definitely worth another look. Easy Goal. Agyemang- We got what we expected from big Pat, always looking to use his pace and caused defenders problems when running at them. Parker- Crunching tackle in his first piece of action. Looks dangerous with his pace, would like more of a look at him as he could scare a lot of full backs. Harris- Looked assured next to Oastler in the centre of defence. Always kept it simple, has promise. Davenport- Looked lively during the first 15mins of the first half in centre midfield but was put out on the wing for the final half hour and got quieter. Needs more time in the centre to impress. German- Always looking to beat the offside trap, pace caused all sorts of problems. Needs more match time before threatening the first team. Somma- After seeing he has scored 3 goals in 5years I didn’t expect much. Worked hard, was a Nygaard like work rate but for me needs a bit more. Maybe give him another run out to see what he has got just to make sure before we send him packing. Unlucky with the disallowed header. Well, it was hardly a surprise, but Dexter Blackstock finally completed his move to fellow Championship side and big spenders, Nottingham Forest. Blackstock joined the R's from Southampton in August 2006 and went on to make 116 appearances in all competitions, scoring 32 goals. Dexter scored two goals in six appearances for Forest on loan last season and was in Nottingham for a medical yesterday and having passed that and agreed personal terms, has now completed the switch for a fee in the region of £1.6m on a four year contract. Personally, Blackstock is a player I have rated very highly and am very sorry to see him go and more importantly, I only hope the club have a replacement lined up very soon. It only remains to thank Dexter Blackstock for everything during his time at QPR and wish him all the best for his future at Nottingham Forest!!! Rowan Vine was on target for the R's, but it was not enough to prevent the R's crashing to a 3-1 defeat at the hands of NK Karlovac - in a game that saw Czech keeper Martin Lejsal and Italian striker Alessandro Pellicori take the field in their attempts to win themselves contracts at QPR. QPR took the lead just before the break, when Faurlin found Vine in the penalty area with a free kick and the striker scored at the second attempt from 6 yards. As like the usual friendly outings, there were substitutions aplenty in the second half and with 20 minutes or so remaining, the R's collapsed and went on to concede 3 goals in 11 minutes. Angelo Balanta staked his claim for the first team, with an impressive double last night as QPR drew 2-2 with Celje in Slovenia. Balanta opened the scoring midway through the first half and scored again just after the hour mark with a fine finish from an difficult angle. In between, the home side equalised just before half time and went ahead almost as soon as the second half had begun. The game saw a first start in a Rangers shirt for new Argentinean signing Alejandro Faurlin. 'I thought the lads were excellent tonight. Each and every one of them worked their socks off in boiling hot temperatures, and I can't praise them highly enough." QPR: Cerny (Putnins 61), Ramage (Brown 63), Gvozdenovic (Ainsworth 60), Connolly, Gorkss (Oastler 63), Leigertwood (Mahon 37), Routledge, Balanta, Helguson, Faurlin (Alberti 57), Agyemang (Borrowdale 61). 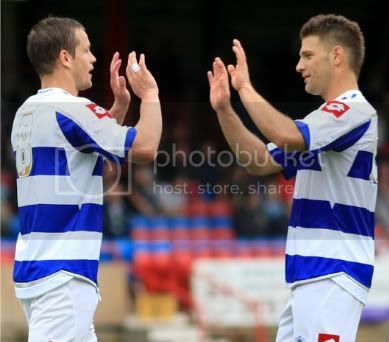 Lee Brown brings us his report from QPR's 4-0 friendly win away at Aldershot on Saturday, in Jim Magilton's first game in charge. Many thanks, Lee! Well it was the first pre season friendly of the season time for us to see how preparations are coming along with the season 4weeks away. With all pre season friendlies you can never read into them too much as its more of a fitness based exercise than a performance that us as fans should worry about. On a lush and very wet surface the game kicked off with a first team team that was very experimental and in a 4-4-2 formation. The team was (from right to left): Cerny; Rose, Hall, M Connolly, Borrowdale; Routledge, Alberti, Mahon, Buzsaky; Helguson, D Connolly. 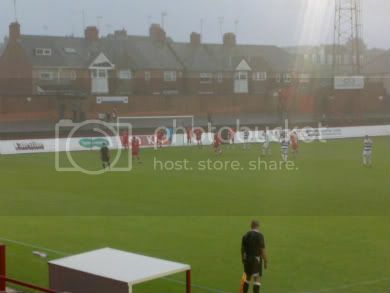 Aldershot started the brighter of the 2 teams and were playing some attractive passing football, causing our midfield and defence a number of problems at times. It took until the 12th minute before Rangers had a decent effort on the Shots goal, Routledge crossing into the trialist David Connolly, who flashed his shot just over the bar. A lot of Rangers more dangerous attacks were coming from our wide areas with Routledge and Buzsaky causing a fair few problems on numberous occasions. The breakthrough came on 25 minutes, Alberti, who was in the unusual role as a centre midfielder, found Buzsaky on the left edge of the 18yard box and he took on 2 defenders before unleashing a thunderous effort into the top right hand corner. 1-0 Rangers. Two minutes later it was 2-0. Buzsaky sent in a scuffed cross from the left which seemed to foil everyone except Helguson, who done his best to miss the target from close range but fortunately his effort hit the post and trickled in. Aldershot continued to play some very good football, and if it wasnt for a last ditch challenge from Matt Connolly when one of their strikers was through on goal then the scoreline could've easily been 2-1. With a more assuring team fielded in the second half it was nice to see us try out something different and it also gave us a chance to see some youth in with some more experienced 1st teamers. Rangers looked more comfortable from the beginning and it wasnt long until a 3rd goal was added. Leigertwood, who was captaining the second half team, dinked a ball over the top of the Shots defence and the pacey Agyemang took chase, out sprinted the defence before taking 3touches and lifting the ball over the advancing Aldershot keeper. A well taken effort. A fourth goal followed 5 minutes later. Ainsworth's cross from the right caused all sorts of confusion in the Aldershot defence and Blackstock was on hand to tap home an easy effort to really kill the game off. Aldershot did nearly get a goal that I feel they deserved from their 1st half performance, Oastler mis-timed his sliding tackle to upend one of the Aldershot strikers. The penalty was very Gareth Southgate like and Cerny managed to produce a comfortable save. The last memorable action of the second half was when Ainsworth challenged a 50-50 ball and crunched into one of their poor defenders which left him needing treatment for a good 5 minutes or so. I wouldnt be surprised if Ainsworth had some studs going up the side of him either. Vine did have to come off with 10-15 mins to go, he looked to be holding his knee, hopefully it was only a precautionary thing. A quick round up of how I thought individuals looked. Rose - For an attacking midfielder playing at right back I thought he looked hungry and it will be nice to see him develop. Hall - Looked very rusty and played a lot of hoof balls. Borrowdale - After today you can see why he never got near the 1st team last year.Very poor, disinterested, looked like a kid in a playground attempting to play football. Buzsaky - Star of the 1st half, scoring 1 and assisting the second, flashes of the old Buz. Oastler - Seemed reassured in possession, was unfortunate with the penalty decision. Definate promise in the youngster. Gorkss - Played simple football and was very assured. Leigertwood - Wasnt at his best today but set up the 3rd. German - Didn't have long to do anything. Well, it's been a long time coming, but QPR made their first signing of the close season today, smashing their transfer record by signing Argentinian playmaker, Alejandro Faurlin. The deal, which is subject to International clearance, is said to be worth £3.5m. GOOD LUCK Alejandro and WELCOME to QPR!! !